Getting homemade food on the table every day can be hard. Finding time in our busy lives to cook all of our meals from scratch can seem nearly impossible some days. But with a little forethought and planning, it is possible to get healthy, flavorful, home-cooked food on your family table each and every day. Today I am so excited to welcome Jill Winger from The Prairie Homestead who is here to share her tips for getting made-from-scratch food on the table even when we’re super busy and short on time. To give you a little background on Jill, I started blogging back in 2011 when most people still didn’t even know what blogs were, and Jill was already blogging even before me. I remember I found her blog, The Prairie Homestead, way back then and was so excited to find someone else who was blogging about some of the same things I was blogging about: homesteading, raising our own food, cooking from scratch, preserving, etc. Listen in below to the full podcast, Episode #173 Traditional Cooking Tips to Get Homemade Food On Your Table Every Day , of the Pioneering Today Podcast, where we don’t just inspire you, but give you the clear steps to create the homegrown garden, pantry, kitchen and life you want for your family and homestead. Jill is, of course, still blogging about all of these things, and I’m still following her and taking inspiration from her blog to this day. So welcome Jill! 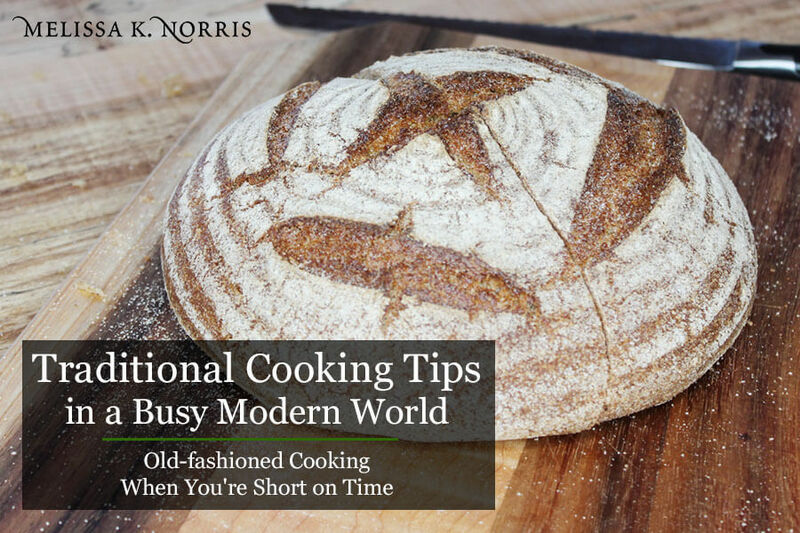 It can be really difficult to find the time to spend in the kitchen preparing all of our meals from scratch, especially since most of us are already busy juggling all of the responsibilities of modern life, including working day jobs, keeping up with social and professional obligations, plus any homesteading stuff that we’re doing like raising food, preserving, maybe even homeschooling, etc. So first of all, Jill, is this something that you feel like you struggle with at all? Jill: Oh Man, absolutely. I think both of us, we work from home and have this online presence and people might assume that we’re in the kitchen all day wearing cute aprons and cooking up a storm 24/7. But I have a lot of other things going on that keep me really busy. We’re running a business from home, we homeschool and there are always outside projects going on, so kitchen time for me is really just as limited as it would be for someone who works outside the home. It’s definitely been a learning process and a little bit of a juggling act over the years to figure out how to balance it all. I think finding that balance is a pretty common struggle for most people nowadays. Melissa: Yeah, I think so. I know I struggle with it. And I think it’s a relief for a lot of people to hear that it is a struggle even for those of us whose livelihoods revolve around doing this stuff. But there are ways to balance it all and to get made-from-scratch food on the table, at least most nights. Jill: Absolutely. It can be done. For us it’s been a process, but there are a couple things that have helped set us up for success. First, I want to preface this by saying we’re not perfect and there are days when I’m like, “get out the Costco tortilla chips. We’re having nachos because I am out of energy to come up with something creative.” But most days I do manage to get something on the table that’s mostly homegrown, made from scratch and tastes decent. In order to make that happen, there are a couple little things that I find really help. The first thing that I do is plan ahead. I know that sounds obvious and cliché, but it really does make a difference. I don’t have a fancy menu plan and I don’t have it perfectly mapped out seven days a week. But I do have a planner where I roughly sketch out my suppers for the week so I know what I need to defrost, what I need to think ahead with and when I can do that. The whole week goes more smoothly when I’ve got a meal plan because, I don’t know about you, but when it’s getting to three o’clock in the afternoon and there’s nothing for supper and there’s nothing defrosted yet, It makes me really grumpy really quickly! Melissa: I do almost the exact same thing. I have visions of someday being that super organized person that has a month’s worth of meal plans. But the reality is I have never been able to do that. So I try to have supper planned out for the next three or four nights anyway. I focus on cooking a really big meal, usually on Sunday afternoons after we come home from church. So for instance, just this week we smoked a whole chicken on Sunday and had that for dinner with vegetables and sides and stuff. Jill: Yes. It really does help, just that little bit of thinking ahead. I also like to go to our freezer and look to see what we need to use up and then plan my meals based on what we already have on hand and what needs to be used up. Then I allocate that into my planner and I immediately know what I need to defrost. It doesn’t take long, it only takes like 10 minutes to look at what’s in the fridge, what’s in the freezer, and decide what needs to be used up. But it takes so much mental stress off later in the week. Melissa: Yeah, it does. Another thing that I find really helps is having a list of favorite recipes on hand. I have a list of our favorite recipes and favorite dishes that I tend to pull from and rotate and every now and then. This helps because then I don’t always need to come up with something brand new. It really helps to have some key dishes that you know how to make and have the ingredients on hand for pretty much all the time and that you know your family likes. Jill: Yes, I’m the same way. I have a repertoire of standbys and for us it’s really basic stuff like tacos and spaghetti and roast beef/chicken, etc. I know I can always throw those on the table quickly. I always have ground beef, I always have a roast in the freezer and I always have a jar of home canned tomato sauce from last summer. And that’s something that my family likes. Those are surefire crowd pleasers and it doesn’t take a lot of mental energy if I’m in a crunch or I get behind on something. Melissa: What about other things that take more time, like rendering lard or making cheese. How do you fit those more time-consuming kitchen tasks into your schedule? Jill: When it comes to these things, I kind of block out my calendar on say, a Friday or Saturday afternoon when things are a little bit slower. So I know if I do need to tackle a quick canning project or I want to try a new fermentation idea or make some cheese, I usually try to put it into one of the time slots that I’ve blocked out for those more time-consuming tasks. And sometimes there are ways to speed certain processes. Like today, for example, I realized I was almost out of bone broth, so I brought up some beef bones from the freezer that are sitting in the Instant Pot as we speak. I can make broth a lot quicker in the Instant Pot than if I were slow cooking it in the traditional way, but it’s still just as good. Melissa: I think that brings up an important point; Don’t be afraid to lean on those modern appliances or those conveniences if you need to. 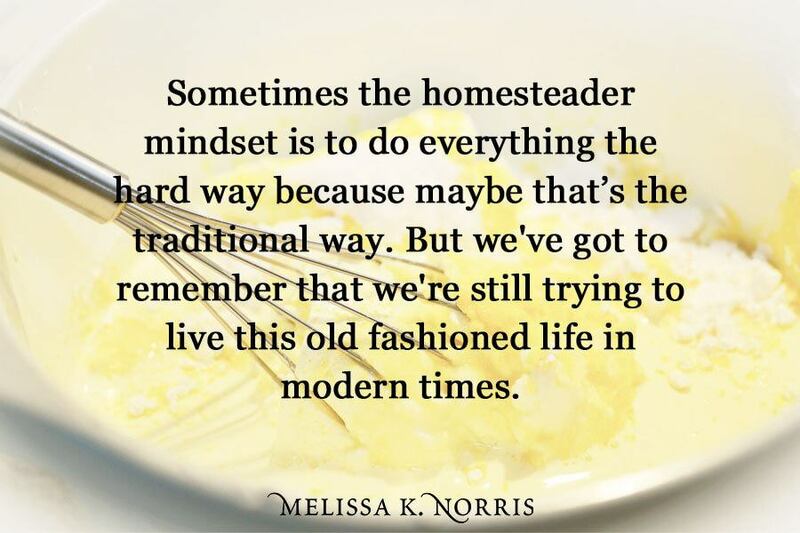 Sometimes the homesteader mindset is to do everything the hard way because maybe that’s the traditional way. But we’ve got to remember that we’re still trying to live this old fashioned life in modern times. Ma Ingles didn’t have to drive her kids to homeschool co-op on Thursdays. She wasn’t running an online business or going to work in an office every day. She was home all day and didn’t have modern appliances and conveniences to rely on, so she cooked the way she did out of necessity. Nowadays there’s nothing wrong with using an Instant Pot or a food processor to chop onions or shred cheese The food is still homemade, it’s still made from scratch and if you can use a little bit of electricity to get the job done faster, and make life a little easier, I’m all for it. Jill: Yeah, I think if your dream and goal is to do everything off-grid without electricity, go for it! But if you’re not doing those things, it certainly doesn’t make you any less of a homesteader. Melissa: I think the key to getting made-from-scratch food on the table at least most of the time is to not overwhelmed yourself and to make it sustainable. If using electricity and modern appliances helps with that then that’s the most important part. Jill: The key really is to set it up so it can becomes a part of your schedule and your life and your routine. Make it so it’s something you don’t dread so that it just flows into your life and it will to be a lot more long lasting. Melissa: My Dad has always raised our own meat and we did pasture raised. Grain (aka corn) is not something you really grow here in the Pacific northwest by the acre and we didn’t have the extra pasture or equipment for that type of set-up. Our cattle weren’t grain fed because we just couldn’t afford it. But we had grass and hay, so we always had grass fed beef growing up. We just didn’t know that it was cool back then like it is now. I grew up cooking grass fed meat but there can definitely be a learning curve. Jill: There really is, and I struggled with it when we were first married. Oh my word. It was horrifying. I just couldn’t figure it out. I couldn’t figure, I wasn’t, I don’t think I was cooking along enough was the problem. Especially when we started those first few years. It’s not hard. You got to have the right information. Melissa: Yeah, I agree. It’s one of those things, kind of like gardening and cooking truly as some of the most simple things and the world. But it doesn’t always feel easy. And sometimes it’s just the smallest little changes. Like they don’t seem like they’re that big where they can make a world of difference in the way that things taste turnout. Yes, absolutely. So I have to ask then, because we can’t leave people hanging, right? So what is the secret? Is it just the cooking time on getting the roast from being like, oh, I can’t eat this too. Okay, now it’s pretty amazing. Jill: Yes. What I used to do is I take a roast out of the freezer, plop it in the Crock Pot and let it cook for five or six hours on high. That is not a good idea. You have to let your meats defrost, which is why that planning stuff we talked about earlier is so key. Take your defrosted roast, season it with salt and pepper, and then sear it in a little bit of lard or bacon grease or even butter. Get a nice brown crust and then stick it in your Dutch oven or a slow cooker or whatever with a little bit of liquid and some herbs and some worchestire sauce. Then let it cook low and slow all day and it will literally melt in your mouth. Melissa: So speaking of cooking and making all these foods from scratch, you have a cookbook coming out! Jill: I do! Our very first book is coming out soon. It’s been such a labor of love, I feel like I’m having my fourth child! There’s a lot of heart and soul in this book. It was not written by a ghost writer. It was not thrown together from past blog posts… It’s all me. So in case you’re curious, it’s called The Prairie Homestead Cookbook, and it’s full of heritage-style American comfort foods, all made-from-scratch twists so there’s no processed foods, commercially canned ingredients, boxes, packages, etc. There’s also a part in the back that helps you learn how to grow your own ingredients and offers a little extra homestead inspiration. You can get it on Amazon, Barnes and Noble or anywhere books are sold. And after you preorder or order it, you go to www.homesteadcookbook.com and grab a giant bonus pack full of ebooks, videos, a free sourdough starter, some free tea and all kinds of other goodies. I don’t know about you, but when I first started learning how to cook, it wasn’t awesome. I didn’t even understand how to sauté onions or add herbs to dishes. But everybody has to start somewhere, and having someone walk you through it can really speed up the process. That’s what this cookbook aims to do. Melissa: Well, Jill, thank you so much for coming on today’s episode! Jill: Thank you so much for having me. It’s always so much fun.